Through Google's search and advertising programs, businesses find customers, publishers earn money from their content and nonprofits solicit donations and volunteers. These tools are how Google makes money, and they’re how millions of other businesses do, too. 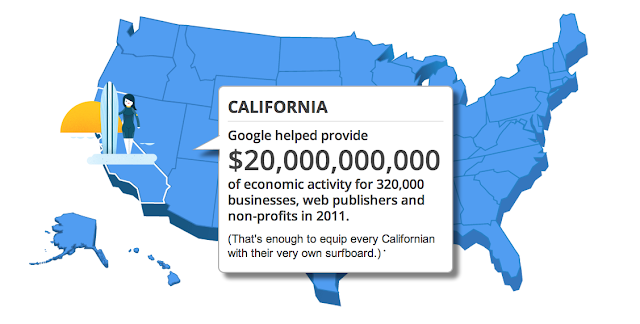 In fact, in 2011, Google’s search and advertising tools helped provide $80 billion of economic activity for 1.8 million advertisers, website publishers, and nonprofits across the U.S. You can see Google's economic impact in each state on Google's Economic Impact site, along with the stories of local businesses who have used Google to help grow their businesses.